The town of Vila-real has again become these days the “world capital of police mediation” thanks to the second edition of the Ibero-American Congress of Police Mediation held until Friday [April 15] ]at the Municipal Auditorium Músic Rafael Beltrán Moner with more than 400 congressmen and 40 speakers. The mayor, José Benlloch, the president of the Generalitat, Ximo Puig, the rector of the Universitat Jaume I, Vicent Climent, and the chief of the local police, José Ramón Nieto, inaugurated this morning the congress, organized by the city of Vila-real collaboration with the UJI, which aims to “deepen the values ​​of dialogue and agreement” as effective and efficient tools for conflict resolution and “peace-building”. 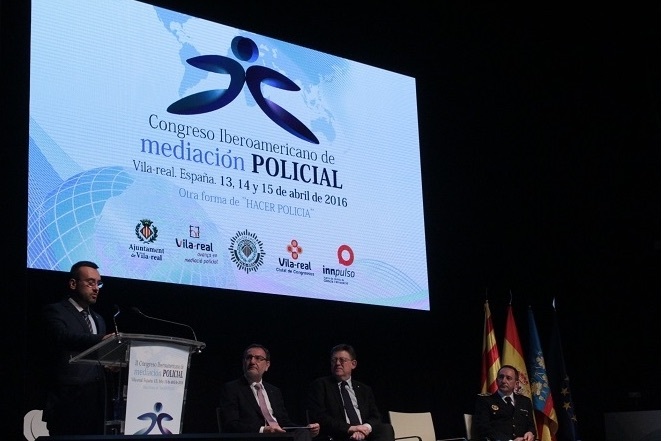 Benlloch highlighted especially the role of local police in Vila-real, through the Unit of Police Mediation and the Department of Police Mediation of the University which are consolidating “a methodology still in its infancy but which has already shown its full potential “. “The police unit that was born as a pioneer in 2004, has given new answers to different realities. Today it marks the way forward for police forces around the world,” says the mayor. To further strengthen this discipline, from the theoretical and practical level, Benlloch advocates a reform of regional laws concerning local police that “gives greater means to our bodies of municipal security, who are closest to the problems of people, that incorporate a culture of mediation as an intrinsic part of their work”; this is a reform on which, he points out, the Generalitat of Valencia has been working in recent months. After the inaugural presentations, the mayor of Vila-real delivered the first lecture of the conference, which in its first day featured speakers such as Peter Blasco, on behalf of the NGO Messengers for Peace, the inspector general commissioner of the National Police of Panama, General Willington Zambrano, and the human rights activist Mamadou Dia. The morning session, included the award of the Josep Redorta prize to deepen the implementation of mediation in police forces in Latin America, while on Friday the Alternative Nobel Laureate and founder of les Peace Studies, Johan Galtung, spoke at the closing session.